The experience of Lent is a spiritual journey whose purpose is to transfer us from one spiritual state to another, a dynamic passage. For this reason the church commences Lent with the great repentance Canon of St Andrew of Crete. This repentant lamentation conveys to us the scope and depth of sin, shaking the soul with despair, repentance, and hope. The only times it is appointed to be read in church are the first four nights of great Lent (clean Monday through to clean Thursday, and fourth sections of each ode are read at great compline) and at Matins for Thursday of the fifth week of great Lent, when it is read in its entirety (in this latter service, the entire life of St Mary of Egypt is also read). This complex poem (actually a chanted hymn) was written in the early 700’s, and it picked up the adjective “great” for two reasons: it is extra-long (about 250 verses), and it is majestic. It is a liturgical poem consisting of nine odes. The great Canon was written by St. Andrew of Crete, a bishop who was initially a monk in Jerusalem. The whole Canon is a kind of “Walk Through the Bible”. St. Andrew begins with Adam and Eve and goes all the way through, exhorting himself by applying the stories and characters of the Bible. Reading the Canon helps us see how Christians in the Holy Land, 1,300 years ago, understood the Scriptures. It is a way to time-travel, and actually joins them in these ancient Christian devotions which are part of the dynamic life of the church. 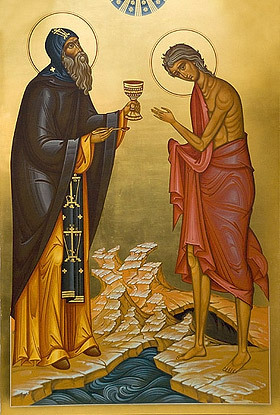 Father Alexander Schmemann says about the ‘great Canon of repentance’ that: “…with a unique art, St. Andrew interwove the great biblical themes – Adam and Eve, Paradise and the Fall, the Patriarchs, Noah and the Flood, David, the Promised Land, and ultimately Christ and the Church – with confession of sin and repentance. The events of sacred history are revealed as events in my life, God’s acts in the past as acts aimed at me and my salvation, the tragedy of sin and betrayal as my personal tragedy. My life is shown to me as part of the great and all embracing fight between God and the powers of darkness which rebel against Him”. 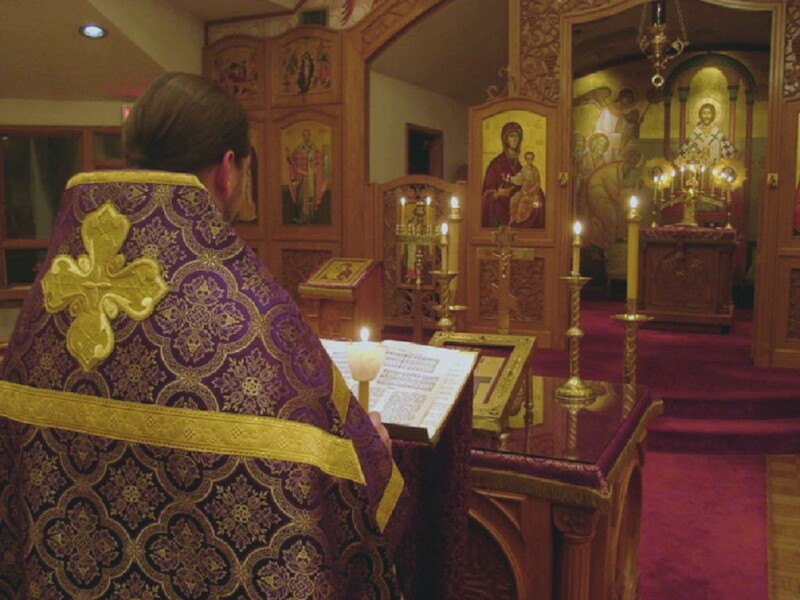 Of the Canon, Father Alexander, continues: “The Canon begins on a deeply personal note…One after another, my sins are revealed in their deep connection with the continuous drama of man’s relation to God; the story of man’s fall is my story”. Father Alexander goes on to say that these stories from Scripture are so much more than merely allegories. He reminds us that even though we are each unique persons, we are all moving through the same drama. We all face choices that through the ages others have faced before us and just as we must choose the sacred pathway to return to God so they had to choose; and in their choosing have much to teach us, to remind us, to reveal to us the tried and tested path to life. And it is in this way that my own and deeply personal sin becomes the lens through which I can begin to grasp the real importance of His redemptive acts. Part of the reasons that we are so vividly lukewarm in the faith, according to Father Alexander, is that we are too much concerned with things of the world, and we fail to remember the true heights from which we fell from grace as sons and daughters of Adam. This is something that is common to all mankind through the ages, but Father Alexander adds another element to this that brings it closer to the reality of contemporary life. He says: “Sin … is thought of primarily as a natural “weakness” due usually to a maladjustment, which has in turn social roots and, therefore, can be eliminated by a better social and economic organization. For this reason even when he confesses his sins, the modern man no longer repents … [he] shares his problems with the confessor – expecting from religion some therapeutic treatment which will make him happy again and well-adjusted”. However, the great Canon, says Father Alexander, reintroduces us to the truth about sin and our sinfulness. It directs us back to the culture of Creation, Fall, and Redemption where we may have some chance at once again to recall our experience and existential failures within our life, therefore repentance from sin is: “…the shock of man who, seeing in himself the “image of the ineffable glory,” realizes that he has defiled, betrayed and rejected it in his life; repentance as regret coming from the ultimate depth of man’s consciousness; as the desire to return; as surrender to God’s love and mercy … [allows confession to become] meaningful only if sin is understood and experienced in all of its depth and sadness”, as the rejection of communion with God. Unfortunately, the culture in which we live excludes the concept of sin or distorts its notion in relation to the biblical and Christian tradition. For if sin is, first of all, humanity’s fall from an incredibly high altitude, the rejection by humanity of its ‘high calling’, what can all this mean within a culture which ignores and denies that ‘high altitude’ and ‘calling’, and defines a human not from ‘above’ (according to the image and likeness of God) but from ‘below’ (according to mere biology or physiology). Sadly this culture we live in thinks of human life only in terms of material goods and thus ignores the fact that human beings have a transcendental vocation. The biblical and Christian tradition of sin has a depth and density which the culture in which we live is simply unable to comprehend and which makes confession of sins something very different from true Christian repentance. For this reason the great Canon reminds and teaches us that the ground that we need to walk in order to return to anything resembling the “image of the ineffable glory” is a field that we too often leave uncultivated and neglected. For most of us, locked into the familiarity of institutionalised, rule bound, and well worn praxis the simple words in the Canon which have so much to do with acts of self-denial and obedience, are a wilderness of exceptionally rich and unfamiliar ground, in the culture in which we live and which shapes our world-view. This poem, beloved by the Eastern Church, lets us overhear a conversation between Christ and an old man, who knows he will soon die and then face judgment on all the deeds of his life. It is a dialogue between St. Andrew and his soul. The ongoing theme is an urgent exhortation to change the direction one’s life. St Andrew always mentions his own sinfulness placed in juxtaposition to God’s mercy, and uses literally hundreds of references to good and bad examples from the OT and NT to “convince himself” to repent. Andrew asks renewed forgiveness for his known sins and the light to uncover any hidden leanings still within him that, if uttered, would show how unfit he was to talk openly with his Lord. Christ, in words found in Scripture, reminds Andrew of how all-inclusive the two commandments of love are, and how eager he is to greet prodigals when they return. To many the mere thought of anyone having to face judgment will be terrifying. Imagine: an all-knowing God coming to question us, weak from age, about things we did in youth, middle age, and later years! When, however, we hear this poem chanted in church, it will strike us as indeed grave, but still consoling because it shows Christ’s never-failing desire for us to become one with Himself. He wants to talk personally with us in the way God did with Adam in the coolness of the afternoon. Andrew has a vivid sense of his own failings, but, despite this, the conversation between him and Christ is between people who love one another. Andrew is talking to his soon-to-arrive judge, but he knows Him to be presently anxious to help him put on the wedding garment guests need to wear. The old man grieves over his past wrongdoing, but expressions of this concern are interspersed with memories of his master trying to find lost sheep or search for lost coins that have the king’s image stamped on them. Even more to the point, Christ condemns our failings because He wants us to be better and to live fully. In listening to Andrew, Christ hears an old man who has spent his life seeking to find what his Master wants. Now, in these last days, that old man is striving to know whether there are unknown commands he has not heeded, or failings he has neither recognised nor confessed. From the bottom of his heart he is begging his Lord to help him become a good disciple; he fears being disowned by someone he loves and whom he knows wants him not to fail. There is no better way for any of us to learn what God wants of us than meditating on the stories of good and bad men spoken of in Scripture. Andrew has been pondering on them during all the years of his monastic life. Now, in old age, he is going over in his mind texts grown dear to him and peering into them in hope of discovering lessons he has missed. He does not, like some scholar, speak in an orderly way of all parts of Scripture simply because they are there to be read dispassionately. Instead Andrew will be listening for messages God set down for us to heed. In the light of those stories there is one more chance to find out how he falls short of thinking and feeling as God does. Memories of past blindness renew his worry about wrong desires that may still be lurking in some corner of his heart. Therefore he keeps asking for both forgiveness for the failings he knows about, and help for him to uncover still hidden ugliness. The great Canon shows us the thoughts of someone who reads the Scriptures in an effective way. He knows stories about God’s interaction with outstanding men and women from the past, and, as he thinks about them, he uncovers their bearing on him. So his impending meeting with Christ is not something unlooked-for; on the contrary it is a culmination of many years spent talking with his Master about his actions and how to make them better. The church invites us to listen to this poem during Lent firstly, because we too will have to face judgment and secondly, Lent is a time for readying ourselves to rise into the newness of life made possible by Christ’s death and resurrection. By joining our minds and hearts to these words as they are chanted, we may, with the help of the Holy Spirit, gradually come to see hidden failings in our life, and so more clearly recognise our need for forgiveness and purification. Because the great Canon has the possibility of taking on real importance in our spiritual life, we should make an attempt to say exactly what kind of poem it is. A well-known theologian, Olivier Clement, calls it “A Song of Repentance”. As we grow older and have a wider experience of coping with the world, we will, as we pray, recognise how much we need to take a deeper look at what we are doing. We will discover unsuspected ways God’s commandments bear on what we are or not intent on doing. What loving God and our neighbour means will emerge gradually through prayer and meditation on scripture and our own mindset. Again, as this happens, our pleas for mercy and forgiveness will become more to the point and more earnest. Open unto me, O Giver of life, the gates of repentance. Bearing a temple of my body all defiled. Before Lent the church tells us to pray for repentance, and then during the first four weeks of Lent it has us listen to Andrew’s poem. This proximity of antiphon and poem suggests a connection between Lent and the hope for repentance. Come wretched Soul with thy flesh to the Creator of all. 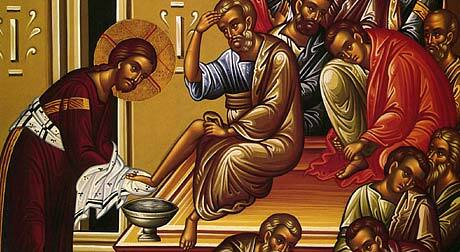 And offer to God tears of repentance (Canticle 12). A violent change came over David when he awoke to the fact that he had forsaken God. This response was not just another good action he did during his lifetime. It was a shaking experience and it profoundly changed his relationship with God. And, in thy compassion, grant me tears of compunction. Falling down before Christ because we realise we have sinned, asking Him for mercy, begging that the heavy weight of sin be removed, are all parts of repentance, and so is praying for grace to help us shed tears of remorse. David abjectly fell down before God as soon as he recognised that his actions toward Bathsheba and her husband betrayed his duty toward God. This discovery happened suddenly. David learned that God condemned his actions since by doing them he had forgotten God. In his sinful state David no longer talked to God about his desires, his hopes, or his fears. Wrong choices had taken over his life. He had to spend his time thinking up excuses and lies to keep others from finding out what he had done. He did not even think of asking God for help. For the first time in his life he was walked alone without the awareness of the presence of God. What God does or doesn’t want was no part of his concern. This attitude was decidedly new for David. When he decided to kill Goliath, he did so because he thought it was wrong for an uncircumcised heathen to threaten those whom God had chosen for His own. 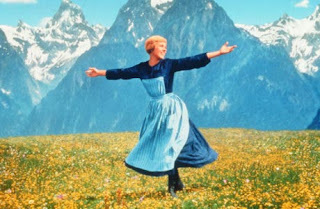 Now only Bathsheba’s beauty filled David’s mind. Andrew accurately describes David’s new experience as an awakening; and for that reason the words of the poem tell us accurately what repentance is and they invite us to see how, like David, and, indeed, Andrew, we can change our path even when we sin. What is crucial here is the “once” of David’s mind fixed on Bathsheba’s beauty and the “later” of his repentance. Repentance is the decisive change that happened between these two moments. It took a special intervention from God for David to change. Repentance is something new and sudden like our being created or our Baptism. Prior to hearing Nathan’s message David’s mind did not waver. As soon as he saw Bathsheba, he forgot God, seduced her. Then he started to worry how he could get away from the trouble that might arise when others learned what he had done. When his first efforts at a cover-up failed, he arranged for the woman’s husband to be murdered. Safeguarding his reputation filled his mind. For him to repent, something outside these thoughts had to burst in on his darkened mind because David’s eyes could not be opened of themselves; God had to intervene. God, unlike David, wanted their close friendship to live again. The wellspring of repentance is God actively seeking out the sinner and helping them change their mind, heart, and therefore their path. David now knows his heart has for a long time been turned away from God. He had settled into adultery and murder. That turn of mind makes him worthless; he is just one more man fleeing from God. That is why he can say, “Against thee alone have I sinned”. Taking Bathsheba and killing her husband are indeed sins against them, but by cheating them David broke the commandments of God and robed himself of his right to life. The parallelism between Nathan’s words and David’s deeds was so close that David’s ears were immediately opened. He saw how he was misguided and so pleaded for mercy. This is the true meaning of repentance. Before his sin David of course knew the commandments, and was consequently, on one level, aware that adultery and murder were wrong. That knowledge, however, existed in a separate part of his mind than the operative part absorbed in Bathsheba’s beauty. In this sense, Andrew expects us to think of repentance as an awakening to the realisation that we have turned from the path of life established by God because of our corrupt choices and actions. Without concern for what God wants from us, our life is trivial and has no true goal. But our desire to please Him joins us to the immensity of God’s activities and purposes for His creation. The first of these is His merciful and unexplainable decision to bring the cosmos and us, out of nothingness into existence. Inseparable from this mysterious kindness, is His equally unfathomable desire to share His own divine life with us, to communicate intimately with us. He had no intention of creating us and then forgetting us. His coming to talk with Adam in the coolness of the afternoon is as genuine a fact as His creating us. He wants to share His life with us and asks that we share freely ours with Him. We know this marvel and feel guilty because we have not consistently tried to keep pace with Him in our daily life. Andrew knows that his life and all of humanity’s life are encompassed in God’s divine plan. Astounding as it sounds, we are called to glory, to be with God. This fullness is already present among us; Christ by His death and resurrection has outdone evil and death. It is a mistake to think of the world and not see the evidence of God’s presence in it and therefore rejoice in it. The kingdom of God is, as Christ says, within us. It shines forth in the faith of millions living and dead (asleep in Christ) who display the truth of what He says. Andrew writes his poem because this uniquely worthwhile link between us and the loving God is dear to him. We are to one degree or another separated from God when we fail to see God’s gift of life to us. Stories in the Old and New Testament spur Andrew on to ask pardon for the known and unknown moments in his life when he forgot to lovingly share his life with his Maker. In this poem, written at a time close to the day he will face judgment, he is once more going over the record of things God has told us about Himself and what He wants from us. Andrew now wants to hear any messages God has sent him and that selfishness may have driven him to ignore. This is the purpose underlying the long reviews Andrew makes of his life, in the great Canon. He is begging God to show him sides of himself that make him unable to be a man whose whole heart and mind are fixed on loving God above all things, and to love and serve his neighbour as himself. The great Canon is an effort to reach that purity of heart. It is a plea for full repentance. We will not learn of Andrew’s past failings in any detail nor will we be privy to new discoveries he makes. He is talking to God who already knows what Andrew has to say and is waiting to hear the admissions it will be good for his disciple to make. If we want to understand the great Canon we must remember the already mentioned fact that it is a conversation between lovers. Andrew does not want to disappoint Christ. Every genuine lover thinks he or she is not worthy of being loved. Each of us almost surely has just reason to suspect his or her words and actions have not always been what they should have been. These memories, though heavy, will not erase the certitude that Christ unfailingly loves each of us and is calling us to repair our past by living with Him. Because of our failures, feelings of guilt haunt us. Because of our blindness in the past we have reason to fear other impairments may be darkening our sight. True lovers unrelentingly struggle for purification. Andrew is asking Christ to make him now fit for their imminent meeting. We too need to ask for this help, and we can count on getting it. It may however come to us in strange ways. God does not start off as a mere spectator of our actions and then turn into a judge. He follows each turn in our actions. The Holy Spirit in His mysterious way knows how to enlighten, strengthen, and guide us while still leaving us free to venture out on our own. God hears us when we pray, though He in His wisdom often fails to give us exactly what we ask for; a refusal is sometimes the favour we need. All of us can probably discover examples in our life when this was true. God wants our real good and helps us reach it. He grieves when we are far off and rejoices when we return to Him. There is therefore nothing plain or prosaic about our life; it is mysterious because God is entangled in it and we are entangled with Him even when on the surface of our mind we are busy only with the people and things around us. Andrew knows that, especially at this late hour, he must talk to Christ about his past failings, so that by growing beyond them he can even at that late date become clean as God wants him to be. Christ told us to become perfect as His heavenly Father is perfect. That goal stays beyond rational explanation; nevertheless it is, as we have remarked, the primary truth about human life. Squirm as we sometimes do, there is no escape. The only counterweight to our feebleness is trust in a God willing to help us meet Him on His terms. We can count on being more able to love, if we remember that someone has first loved us. Andrew’s poem is full of examples from Scripture showing this truth about how God is operative in the world and in personal lives. Andrew is talking to someone who cares for him and in his poem he will share with us his reasons for thinking so. Scripture to the degree we understand it tells us what God intends. It contains stories of God’s relationship with His people. That gives us a start on finding who we are. To learn more, we must search this record of what He thinks and keep on comparing it with memories of what we have in fact loved and neglected. God sees the meandering of our actions and all their strange interconnections and unfolding, and He looks on them with the same loving concern that guides Him while He made and makes us. Nothing happens separate from this benevolence. Reading Scripture in its ecclesial context, under the guidance of the Holy Spirit, gives us a share in this accurate sense of what is going on in the world. When Moses and Elijah met with Christ at the time of Christ’s Transfiguration they recognised Him as the fulfilment of the work they had begun for the race of humanity. Christ too, a man like them, heard His Father praise Him lovingly and tell the Apostles listen to Him. They fell on their faces before the splendour shining from Christ and His two predecessors. Those Apostles had, unknown to themselves at the time, their own place in this continuing story of God’s care for His creation. At that moment they did not know their own future; they only knew it was good for them to be there. Peter’s offer to build three tabernacles, one for each of the three heroes of our spiritual history, is, unbeknownst to him, a prophecy of what the church they would help to build would bring about. That same church, active in the whole world, is now making it ready for Christ’s return in glory at the end of time. If, under the guidance of the Holy Spirit, we are able to see in Andrew’s verses that which describes our own relationship to Christ, we are blessed. Each such awakening is a step on our road to sharing God’s nature by His grace. We, like Andrew, must try to uncover hidden complexes in our thoughts and actions that keep our minds and hearts apart from God. Knowing myself stripped naked of God (canticle 1). We should note that although the most central theme in the Canon is repentance from sin, theologically, it does not talk about sin in the common sense of committing an error and the expected punishment from the Judge. Instead, St. Andrew speaks of sin as something that arises from deep inside, from a darkened and confused mind and heart. It is like a self-inflicted wound. 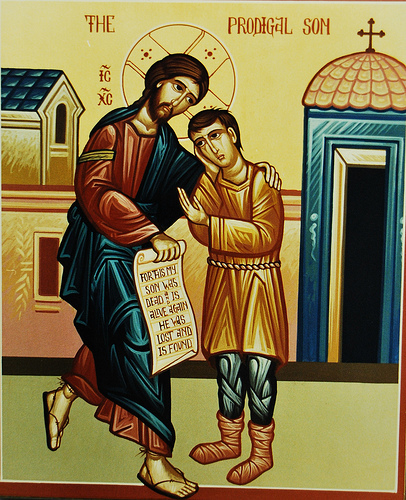 He speaks of God as all-compassionate, rushing toward us with healing love, like the Good Samaritan or the father of the Prodigal Son. In this concept of approaching the tern ‘sin’, there’s no sense that God’s justice or honor have to be satisfied by Christ’s suffering before we can be forgiven. Christ’s suffering, instead, is the “battle scars” of His fight to free us from Death and the Evil One. For this reason, salvation is not just a “legal fiction” that imputes righteousness we don’t really have; it is life “in Christ,” saturation in the lightbearing presence of God. The ability to weep with a repentant attitude is regarded as a gift from God, something that a heart of stone or selfishness cannot achieve by its own power. 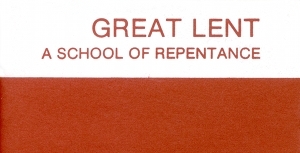 Repentance is regarded as the first phase of transformation. The gift of tears or weeping for ones distance from God is a prerequisite disposition in reaching God. St Andrew’s great canon teaches and instructs us to live a certain life-style appropriate and befitting of our purpose in this life. It demonstrates the sinfulness of all except Jesus and Mary, and yet it highlights salvation offered to all who are willing to repent and accept the ‘good news of Jesus Christ’, out of love. Therefore the purpose of the great Canon is to help humanity become aware of the tragic nature of the unnatural situation in which it finds itself corrupted by sin. Humanity’s broken communion with God (humanity’s brokenness) is renewed by the incarnation of Christ which not only heals but also offers an irresistible hope, as humanity is oriented back to its Archetype. It is reminded that it was created in the image of Christ, and its goal is His likeness. This shows that mankind’s existence has origins, reasons, and cosmological significances rooted in God, since it is created in the image of God. Mankind cannot find beauty without its creator who initially bestowed the miracle of creative and personal existence; this is what it means to approach the likeness of God. The great Canon is part of the Eastern Orthodox tradition, but really, it’s part of every Christian’s tradition; we all go back to first-century Jerusalem. The Canon makes more sense when you experience it in context, as part of the continuous flow of Orthodox prayer, liturgy, fasting, and sacraments. Within the Church, says Nellas, we have a different cosmology that incorporates a different conception of time and space. This is expressed by Byzantine architecture and iconography and is also presupposed by Byzantine hymnography. Everything in the Church seems a metaphor but in actuality is a reality. These anthropological and cosmological settings are to be taken seriously in order to grasp the church’s life as an active, decisive, and salvific reorganisation and refashioning of the limited dimensions and functions of the created world and the created being of mankind. By repenting and living in awareness of one’s brokenness from the source of Life, St Andrew inspires each person who reads the poem to struggle for salvation as did our forefathers. To achieve this goal, St Andrew transfigured scripture by personalising, interiorising, and subjectifying all biblical events and characters evoked in the poem (except Jesus and the Theotokos). For this reason the poem becomes his own creative masterpiece, yet loyal to the Scriptures and Holy Tradition conveyed in the form of poetry; and it relates and penetrates each of us to always keep in mind our task, our salvation in Christ on a personal and communal level. One the one hand, the beauty of the canon is witnessed as a theological treatise which leads humanity to repentance – to refashion one’s self and one’s environment. On the other hand, it is an ecclesiastical liturgical act that transfigures one personally, and in turn the whole world is saved in the one person who returns to God. The great Canon of St Andrew, Bishop of Crete, is the longest canon in all of our services and is associated with the initial stages of the spiritual journey of great Lent. There is no other sacred hymn which compares with this monumental work, which St Andrew wrote for his personal meditations. Nothing else has its extensive typology and mystical explanations of the scripture, from both the Old and New Testaments. One can almost consider this hymn to be a “survey of the Old and New Testament”. It’s other distinguishing features are a spirit of mournful humility, hope in God, and complex and beautiful Trinitarian Doxologies and hymns to the Theotokos in each Ode. St Andrew wrote the Canon to challenge the faithful spiritually. 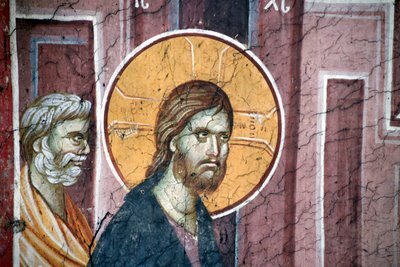 For Eastern Orthodox, all spiritual exercises are designed to heighten our perception of basic reality: Sin is much more serious than we think, and God’s forgiveness is much more vast than we think. Left to ourselves, we go around with Playskool impressions of what’s at stake. So the goal of all spiritual disciplines are to cultivate charmolypi — to use a Greek term coined by the 6th-century abbot of the monastery on Mt Sinai, St. John of the Ladder. Charmolypi means the kind of penitence that flips into joyous gratitude, “joy-making sorrow,” repentance shot through with gold. you neither care nor prepare. The time is growing short. Therefore the function and purpose of the great canon is to reveal sin to us and to lead us thus to repentance, and it reveals sin not by definitions and enumerations but by a deep mediation on the great biblical story which is indeed the story of sin, repentance and forgiveness. It indicates to us the revealed Biblical world-view of humanity, of its life, its goals, and its motivation. It helps us to see that sin is first of all the rejection of life as offering/sacrifice to God; in other words sin is the rejection of the divine orientation of life, sin is therefore the deviation of our love from its ultimate object and subject, the presence of God, God Himself. By offering us this deeper realisation about ourselves and our life, the great canon restores in us the fundamental framework within which repentance again becomes possible, having now found the true dimension of our life by its guidance. 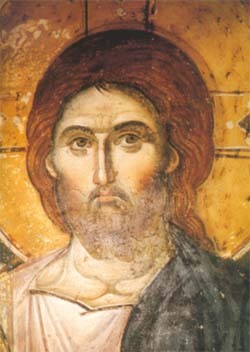 St Andrew was born in Damascus about 660, and joined the Monastery of St. Saba, outside Jerusalem, at age 15. His intelligence and holiness were evident, and he soon became secretary to the patriarch of Jerusalem. 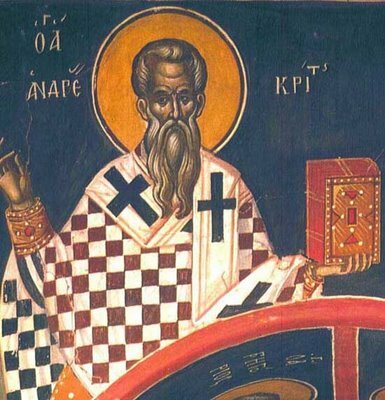 He was a representative at the Sixth Ecumenical Council, and then manager of ministries to the poor, elderly, and orphans in Constantinople, and by the end of his life was Bishop of Crete. 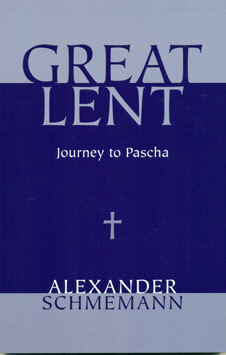 Alexander Schmemann, Great Lent (New York: St Vladimir’s Seminary Press, 1996), 63-67. Panagiotis Nellas, Deification in Christ, trans. Norman Russel (Crestwood, N.Y: SVS Press, 1987), 179. Makarios of Egypt, Spiritual Homilies cited in Panagiotis Nellas, Deification in Christ, trans. Norman Russel (Crestwood, N.Y:SVS Press, 1987),175. Frederica Mathewes-Green, First Fruits of Prayer: A Forty Day Journey through the Canon of St Andrew (Brewster, Massachusetts: Paraclete Press, 2006), 6. 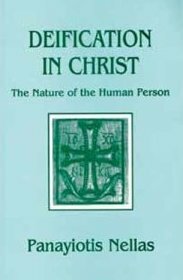 Panagiotis Nellas, Deification in Christ, trans.Norman Russel (Crestwood, N.Y:SVS Press, 1987), 173. Panagiotis Nellas, Deification in Christ, trans. Norman Russel (Crestwood, N.Y: SVS Press, 1987), 169. 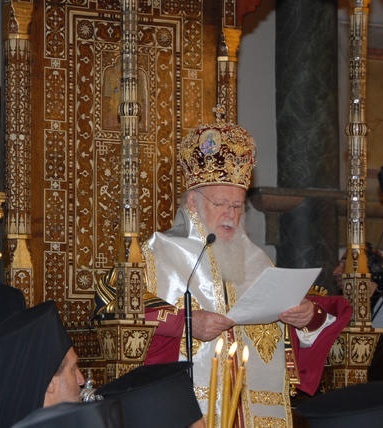 (Father) Doru Costache, ‘Reading the Scriptures with Byzantine Eyes : The Hermeneutical Significance of St Andrew of Crete’s Great Canon’, Phronema 23 (2008).